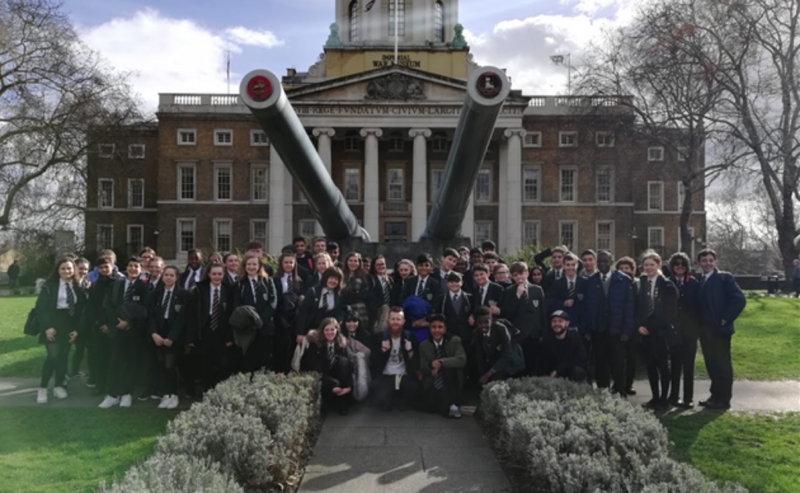 On Thursday 14th March, a portion of Year 9 students were given the opportunity to visit the Imperial War Museum in London, and see the exhibits on the Holocaust and World War 1. Within the World War 1 gallery, students participated in a scavenger hunt/quiz arranged by the teachers. Everyone was given a sheet of paper, and on it were written an array of questions, the answers of which could be found within the exhibit. A prize was offered to any students who could answer all of the questions correctly. This gave students encouragement, making them eager to learn more about World War 1. All aspects of this exhibit were interesting, and students thoroughly enjoyed this part of the day. It gave them a look into what life was like during World War 1 for soldiers, from recruitment to conditions in the trenches. A highlight for many people in the exhibition was ‘The Trench Wall’. This part of the exhibit showed the students what a trench would look like if they were in one, and the added sound effects gave the students a better idea of how soldiers reacted to bombs, gas, or any attack from the opposing side. The second exhibit students saw was on the Holocaust. This exhibit gave a detailed history of the Holocaust, using true stories and impactful imagery. It was able to give students the chance to reflect on the events of the Holocaust, giving them more empathy and understanding towards it, and how it impacted the lives of millions of people. The trip was an amazing experience that students enjoyed and found very fun and enlightening.